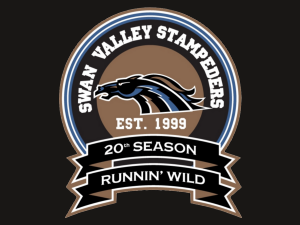 For the first time in franchise history, the Swan Valley Stampeders are off to the MJHL Finals. The team will play for the league title after beating Steinbach 5-3 Monday April 1st, advancing with a 4-2 semi-final series win. After a turnover at the offensive blue line by Josh Tripp, dished it off to Bradly Goethals who made no mistake burying his 7th of the post-season, 31 seconds into the opening frame. Matt Osadick would make it 2-0 as he let a rocket go from the point just over six and a half minutes later. Steinbach would cut into the lead as Riley Vautour would score his fourth of the playoffs at 12:08. Foxwarren, MB product Tucker Scantlebury would score two goals, just over three minutes apart and the Stampeders held a commanding 4-1 lead after 20 minutes of play. Tanner Mole would cut into the Stamps lead at the 6:34 mark of the second period and Kyle Bettens made things interesting in the third, scoring his fourth of the post season at 14:42 but it wasn’t enough. Dane Hirst scored into an empty net and the Stampeders skated to a 5-3 win, advancing to the MJHL Finals for the first time in the teams 20 year history. Final shots on goal were 36-29 for Swan Valley. 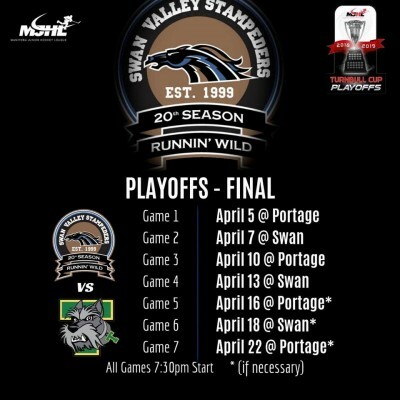 The Swan Valley Stampeders will now face the Portage Terriers in the Turnbull Cup Finals. A matchup that has seemed destined since the start of the year. It’s a clash of the titans in a #1 vs #2.